It’s really not difficult to maintain gender parity in your reading. After you’ve read a book written by a man, you read one written by a woman; and vice versa. Or, as it seems is the case in this Reading diary post, two books by women followed by two books by men. And then, when you have to write about science fiction or science fiction books, or indeed any branch of literature, you’ll have as many female authors you can cite as examples as you have male authors. Having said all that, the books below are a bit of a cheat… I’ve been a fan of Helen Simpson’s short stories for many years and have all her collections (she has never written a novel). The Emshwiller I read for SF Mistressworks. David Tallerman is a friend. So the only book I actually chose to read unaffected by non-textual factors was the Tregillis… and well, you can see below what I made of it. Cockfosters, Helen Simpson (2015). 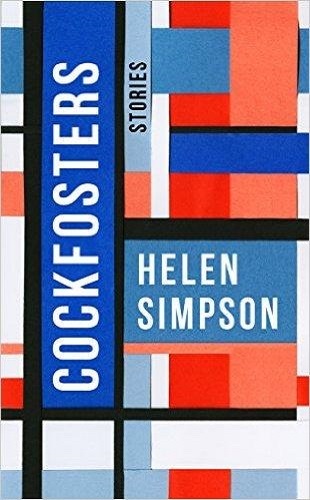 As far as I remember, I first came across Helen Simpson in an anthology of “best short stories” of some sort – I do know, however, that it was her story ‘Heavy Weather’, and I fell in love with it. This was in Abu Dhabi. So on a later visit to the library, I checked out one of her collections – her second, in fact, Dear George & Other Stories. And I’ve been a fan ever since. And yet, the only place I’ve read her fiction has been in her collections – the stories in Cockfosters, for example, originally appeared in Granta, New Statesman and daily newspapers, none of which I read. But hey, that’s what collections are for. There are nine stories in Cockfosters, one of which is genre. In ‘Erewhon’, a husband lies awake at night, worrying about the day ahead, while his wife sleeps oblivious beside him. It’s only as the story progresses, and the hours tick away, that you realise the gender roles are reversed in the world of the story. ‘Kentish Town’, a discussion amongst the members of a book group, is a particularly scathing criticque of Tory Britain. The longest piece, ‘Berlin’, is about a party of middle-aged tourists visiting Germany to see various of Wagner’s Ring Cycle, and how the narrator and her husband slowly come to an appreciation of the operas. Those are the stand-outs, but the others are still highly-polished pieces of prose. Simpson is very, very good at what she does, and Cockfosters amply demonstrates it. 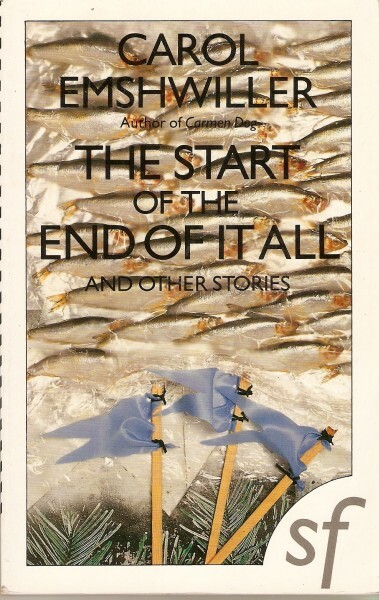 The Start of the End of it All, Carol Emshwiller (1990). I’d read a few of Emshwiller’s stories before in various anthologies, and had always found them the sort of science fiction not to my taste. While there was no denying their quality, they didn’t offer me the things I looked for in genre fiction. And while this collection certainly shows that Emshwiller is a good writer, I found it something of a mixed bag in terms of what I enjoy reading. I’ve been working on a review of it for SF Mistressworks, but it’s been taking a bit longer than expected. 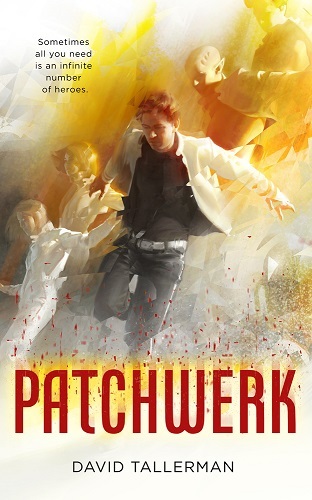 Patchwerk, David Tallerman (2016). Dran Florrian has invented a machine he calls Palimpsest and, afraid it might be used as a weapon, he decides to do a runner with it. But his arch rival, Harlan Dorric, tracks him down and tries to take Palimpsest for himself. Oh, and Florian’s ex-wife, Karen is now with Doric too. Palimpsest apparently provides a means of viewing, and even manipulating, alternate realities – as is revealed when Doric and his goons attack Florrian, and Florrian and Karen find themselves in a completely different world (a steampunkish one, in fact). And so it goes. As the chase continued across alternate realities, it occurred to me this was a very cunning way to expand a short story to novella-length. Because the resolution of the story is not dependent on the realities Florrian and Karen visit – in fact, all they do is delay, or perhaps even obstruct, the resolution. But this is hardly a problem as the story is fast-paced, very readable and manages a more-than-sufficient level of invention. Perhaps the various backgrounds are a little sketchy, and Florrian has a tendency to over-analyse at times; but at short-story length this would probably have been too light on detail to be satisfying, and there really isn’t enough plot to justify novel length. But it works just fine as a novella. Atoms Afloat, Edward Radlauer & Ruth Shaw Radlauer (1963). The NS Savannah, the world’s first nuclear-powered merchant ship, was one of only four ever built. She was launched in 1962 and served as a passenger and cargo ship until 1965, and then as cargo-only until 1972. She was designed as a demonstration model for nuclear power and a show case for Eisenhower’s “Atoms for Peace” project. And she was quite a stunning-looking vessel. The interior was also designed to be in keeping with ship’s “atom age” styling, and looked fantastic. 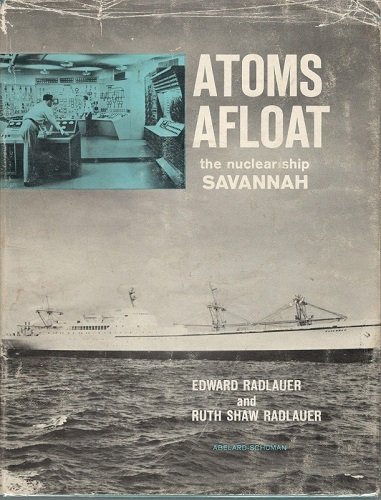 Atoms Afloat is the only book I’ve been able to find on the NS Savannah – and it’s aimed at middle-grade readers. It’s also more about the construction of the ship, and how her nuclear reactor works, than it is her design. But there are some nice photos in the book. I also have a copy of a brochure, published in the late sixties by the shipping line which operated her, and that contains some nice colour photos of Savannah’s passengers spaces. The NS Svannah was a design icon of her age, and someone really should do a proper book on her, filled with lots of colour photographs. Categories: book review, books, reading diary 2016 | Tags: carol emshwiller, david tallerman, helen simpson, ian tregillis, ns savannah | Permalink. There are probably people somewhere on this planet who believe that if you read too many books, you’ll go to Hell. Or maybe it’s just if you read the wrong sort of books. You know, ones with talking rabbits in them or some such. Being a complete atheist, I have no such fears on that score. Anyway, it’s been almost a quarter of a year since I last did a book haul post, and as you can see below the collection has grown somewhat in the interim. Some books were purchased purely for research purposes (honest), and some of them will be paying only a short visit as they go straight back to the charity shop once I’ve read them. And despite the latter category taking up more and more of my reading, the number of books in the house still seems to keep on rising. It’s a puzzle. Books for research and for the space collection. Space Odyssey and Space Odyssey Mission Report were published to accompany the excellent BBC mockumentary of the same title. I bought them cheap on eBay to help with the Apollo Quartet. Promised the Moon is also for research, but specifically for the third book of the Apollo Quartet, And Then Will The Great Ocean Wash Deep Above. I’ve had a copy of Virtual Apollo for several years, but Virtual LM went out of print very quickly and was almost impossible to find. And then just recently new copies started to pop up in various places for £20. So I snapped one up. (I see there is currently a single used copy for sale on Amazon for… £1,965.00!) Countdown joins the astronaut bios section of the Space Books collection. And Caper at Canaveral! is also research; er, honest. I saw it on eBay and couldn’t resist it. I shall, of course, review it once I’ve read it. Two more additions to the SF Masterworks collection: The Hitchhiker’s Guide To The Galaxy, which I must admit to not having an especially high opinion of; and Odd John, which I’ve never read. Extreme Architecture I bought a) because it looked really interesting, and b) as research for the Apollo Quartet. The Origin of Consciousness in the Breakdown of the Bicameral Mind I stumbled across after reading Sebastian Faulks’ Human Traces (see here) and finding its central premise fascinating. 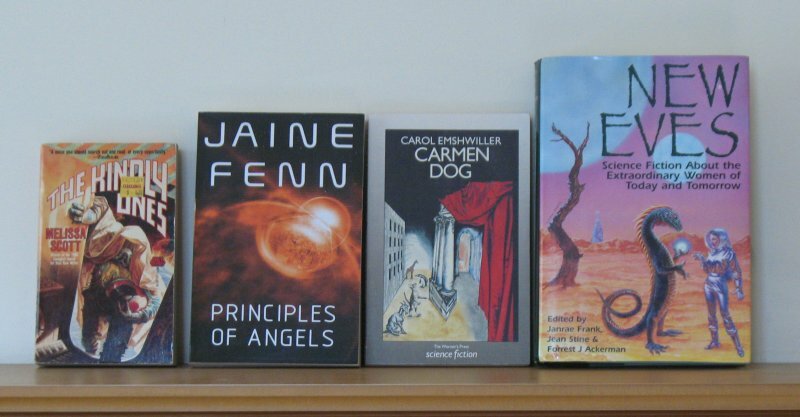 Some books by women sf writers. The Kindly Ones (a popular book title, I have three with it), Carmen Dog and New Eves will all be reviewed on SF Mistressworks. Principles of Angels I’ll review for Daughters of Prometheus. 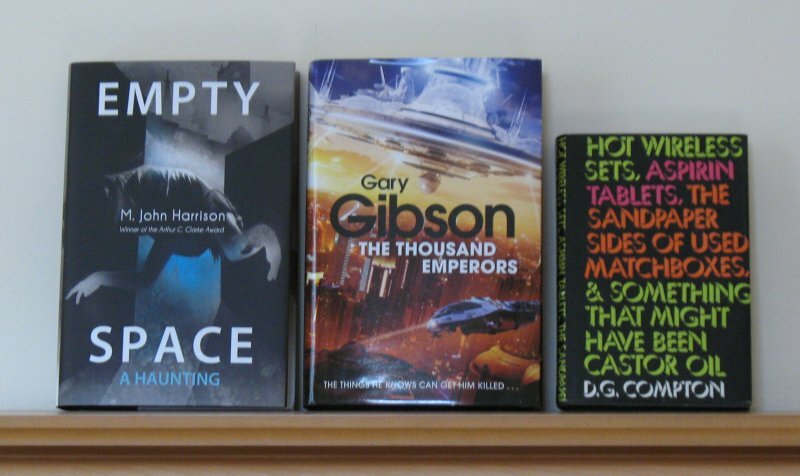 First editions: Empty Space by M John Harrison, The Thousand Emperors by Gary Gibson, and – takes a deep breath – Hot Wireless Sets, Aspirin Tablets, the Sandpaper Sides of Used Matchboxes & Something That Might Have Been Castor Oil by DG Compton. I reviewed that last many years ago under its alternate – and considerably shorter – title of Chronocules – see here. Like many sf readers, I also enjoy a good crime novel on occasion. 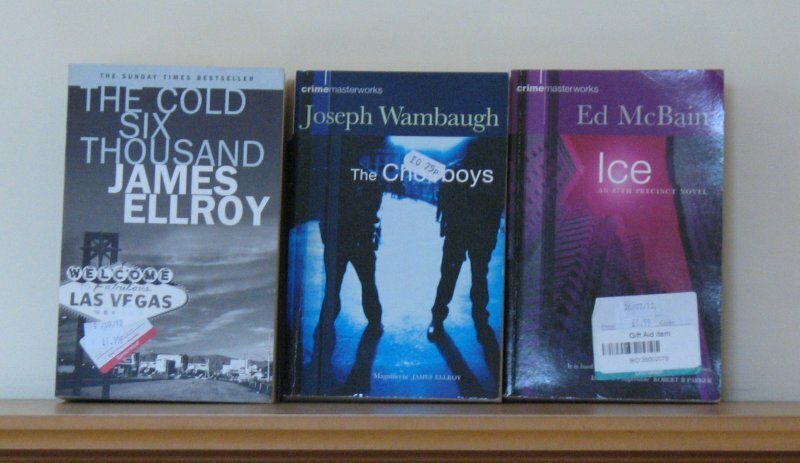 I read crime fiction less than I used to, however, much preferring literary or British postwar fiction these days. All three of the above authors I have read before in the past, but not those particular titles. And speaking of science fiction… I’ve been meaning for ages to complete Benford’s quartet of Galactic Centre novels. I’ve had the first two for years – Great Sky River and Tides of Light – but recently bought the third, Furious Gulf. Once I have the fourth book, Sailing Bright Eternity, I may actually get around to reading them. Bug Jack Barron I found in a charity shop. 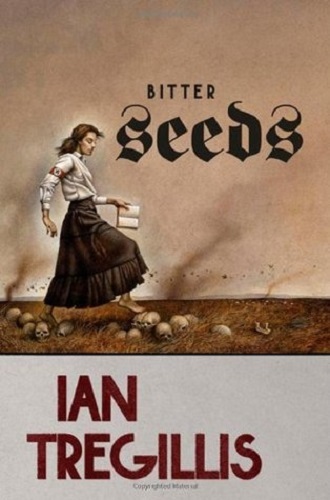 Three Parts Dead I reviewed for Interzone. Yes, I know, an urban fantasy. You shall have to wait until the next issue to find out what I thought of it. Alt.Human is Keith Brooke’s latest. Wolfsangel I bought at Edge-Lit in July, and Mark signed it for me. Swiftly is from – cough cough – a charity shop, and Adam sent me the copy of Jack Glass (which he also signed; I shall treasure it, of course). The Sensationist is the only book by the excellent Palliser I’ve yet to read. I like Liz Jensen’s novels, so I grab then whenever I see them in charity shops… as I did The Ninth Life of Louis Drax. The Piano Teacher and Jamilia are for my world fiction reading challenge – see here for my thoughts on the former. I became a fan of David Lodge’s novels when I was living in the UAE, and A Man of Parts was a fortuitous charity shop find. The Fear Index is a bit of light reading. The Cleft and The Weight of Numbers I found in charity shops. For Your Eyes Only and Invisible Cities were swaps from readitswapit.co.uk. I’ve read the Fleming – it is, of course, terrible, and some of the stories reach new depths in chauvinism. Categories: book haul | Tags: adam roberts, apogee books, carol emshwiller, charles palliser, chingiz atmatov, david lodge, dg compton, doris lessing, douglas adams, ed mcbain, elfriede jelinek, frank borman, gary gibson, gregory benford, ian fleming, italo calvino, jaine fenn, james ellroy, joseph wambaugh, julian jaynes, keith brooke, liz jensen, m john harrison, max gladstone, md lachlan, melissa scott, mercury 13, norman spinrad, olaf stapledon, robert harris, simon ings, stephanie nolen | Permalink.